If trams were still running in Cardiff they would have been at a standstill as everyone’s attention was directed to the bands playing in the Tramshed tonight as King King celebrate their 10th Anniversary Tour. Opening tonight was fellow Manhaton Label artist Sari Schorr and her band the anticipation tonight was double-edged the usual pre-gig excitement and the sadness that Lindsey Coulson the player of the deep notes would be leaving King King at the end of the tour. Sari and her band opened up with New Revolution, hitting the ground running with a track from her latest album Never Say Never. Every time I hear Sari my reaction was the same ‘What A Voice’. No wonder her first album was Force of Nature demonstrating why her vocal gymnastics are a tour-de-force as she delights the growing crowd with Damn The Reason. Sari has the grit of a rock Diva combined with the deep understanding of the vocal storytelling tradition of the blues with a tribute to Robert Johnson, ‘King Of Rock n’ Roll’ we heard this winning combination. The musicians that provided Sari’s vocals with the trampoline to soar tonight by a dynamic rhythm section of drummer Roy Martin and Mat Beable on Bass. Upfront Ash Wilson with his superlative licks and riffs whose interaction with Sari is musical magic. The layers of tonal textures added by the keyboard tonight are provided by the dexterous fingers of Stevie Watts flying over the keys. Closing out a vibrant adrenaline-fuelled set with Valentina provided the climactic icing on the cake. Another storming performance from this great band. King King are mighty they set you free with their own cauldron of musical spells that is blues-rock perfection. The road they have travelled has many twists and turns since I first saw them on a sunny day in June 2009 at Blues On The Farm near Chichester. The line-up has changed over the years the one constant bassist Lindsay Coulson, with Wayne Proctor behind the drums driving out the beat and Johnny Dyke on piano and Hammond. The eagerness for the show to start builds with the entrance to AC/DC’s Highway To Hell. Fans of the band will follow this band on any highway of their choosing. The entrance created an electric atmosphere from the off it was like the Tramshed was up to partying all night! The intensity went up a notch as they opened with Broken and then Lose Control. The band was in total control and nothing was broken as they set the bar high, visiting their latest album Exile & Grace and taking us back to 2011 with debut album Take My Hand. Wow! What a start and then Rush Hour a crowd favourite and one of the many highlights from tonight’s stellar performance. Cardiff never needs to be asked twice to sing and they loved to harmonise on Rush Hour as the Tramshed was awash with melodic heights. We were all Reaching For The Light and found it tonight in Cardiff. The setlist was a perfect combination eclectic, fresh delivered with a fluidity as the four-some played in perfect harmony. Alan held in his hand the mesmerizing power to weave the music with the lyrics this is what makes live music so special. It cannot be described in words, it is a feeling, that mix of tension and excitement music developing for your delight it feels personal to you and you are part of a crowd of friends and strangers united in the love of the band before you. There were numbers from their full repertoire from all their albums spanning the last decade. They were on fire tonight to give Lindsay a great send-off with Coming Home, there was Standing in the Shadows for the bassist tonight. It might have been freezing outside but it was red-hot with pure ecstasy in the venue tonight. 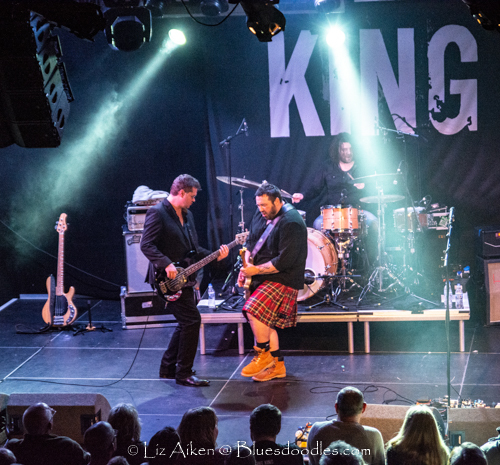 This is the heat and passion only a band on top form riding high can create and the best of King King could be yet to come in their next chapter spanning another ten years. Alan’s charisma wrapped us in the comfort of the tartan King King blanket of Rock-Blues. The solos from Alans guitars were stunning the clarity of tone weaving through the rafters bringing in the warm delicious vocals we all love to hear. This was demonstrated in the wonderful Stranger to Love the stunning lengthy lead break which no-one in the room wanted to end! It was wonderful to hear Take A Look live a real treat one of my favourites. In the early days Alan was his own tech, merch man, load in- and out person now it is different. As if stage managed the nostalgia trip took an unexpected turn as Alan was handed a guitar that he had to tune himself, a skill not forgotten and the music continued. As ever You Stopped the Rain, dedicated to Stevie was an emotional journey recorded live at Alan’s request and dedicated to his mother tonight. This is a song that means so much to Alan we all want it to stay in the set-list for a long time to come. Always a highlight of a King King Show. The encore took us back to the early days with the wonderful Take My Hand and his amazing re-interpretation of Old Love in my opinion better than the original. Alan has made this cover his own. Tonight at the Tramshed they were on a crescendo of blues harnessing the power of rock. Fuelled by that heady mix of superb songs and the camaraderie of the band that surrounds the kilted sorcerer who is unarguably a guitar and vocal conjurer the one and only Alan Nimmo. This evening the band took us on a delightful road trip exploring the albums that have defined King King’s journey over the last ten years. As we wave a warm and heartfelt farewell we thank Lindsay Coulson the bassist that has been the constant by Alan since the beginning of King King’s journey. Tonight, we all thank you, Lindsay, for the wonderful memories you have created in our musical time-bank of delights both playing live and in the studio. Tonight was a very special performance full of a heady mix of great numbers, nostalgia and the turning of the page onto the next chapter in the journeys of King King. Tonight you played with your heart and soul one of the best performances I have heard you play.